For some ophthalmic products, such as the ophthalmic irrigating solution, and some inhalation products, such as Sterile Water for Inhalation, where there are pyrogen specifications, it is expected that Water for Injection is used in their formulation. However, for most inhalation and ophthalmic products, purified water is used in their formulation. This also applies to topicals, cosmetics and oral products. Another design consideration is the temperature of the system. It is recognized that hot (65-80oC) systems are self-sanitizing. While the cost of other systems may be less expensive for a company, the cost of maintenance, testing and potential problems may be greater than the cost of energy saved. Whether a system is circulating or one-way is also an important design consideration. Obviously, water in constant motion is less liable to have high levels of the contaminant. A one-way water system is basically a "dead-leg". Finally, and possibly the most important consideration is the risk assessment or level of quality that is desired. It should be recognized that different products require different quality waters. Parenterals require very pure water with no endotoxins. Topical and oral products require less pure water and do not have a requirement for endotoxins. Even with topical and oral products, there are factors that dictate different qualities of water. For example, preservatives in antacids are marginally effective, so more stringent microbial limits have to be set. The quality control department should assess each product manufactured with the water from their system and determine the microbial action limits based on the most microbial sensitive product. In lieu of stringent water action limits in the system, the manufacturer can add a microbial reduction step in the manufacturing process for the sensitive drug product(s). The introduction provides guidance and states that "Validation often involves the use of an appropriate challenge. In this situation, it would be undesirable to introduce microorganisms into an online system; therefore, reliance is placed on periodic testing for microbiological quality and on the installation of monitoring equipment at specific checkpoints to ensure that the total system is operating properly and continuously fulfilling its intended function." In the review of a validation report, or in the validation of a high purity water system, there are several aspects that should be considered. Documentation should include a description of the system along with a print. The drawing needs to show all equipment in the system from the water feed to points of use. It should also show all sampling points and their designations. If a system has no print, it is usually considered an objectionable condition. The thinking is if there is no print, then how can the system be validated? How can a quality control manager or microbiologist know where to sample? In those facilities observed without updated prints, serious problems were identified in these systems. The print should be compared to the actual system annually to ensure its accuracy, to detect unreported changes and confirm reported changes to the system. After all the equipment and piping has been verified as installed correctly and working as specified, the initial phase of the water system validation can begin. During this phase, the operational parameters and the cleaning/ sanitation procedures and frequencies will be developed. Sampling should be daily after each step in the purification process and at each point of use for two to four weeks. The sampling procedure for point of use sampling should reflect how the water is to be drawn e.g. if a hose is usually attached the sample should be taken at the end of the hose. If the SOP calls for the line to be flushed before use of the water from that point, then the sample is taken after the flush. At the end of the two to four week time period, the firm should have developed its SOPs for the operation of the water system. The second phase of the system validation is to demonstrate that the system will consistently produce the desired water quality when operated in conformance with the SOPs. The sampling is performed as in the initial phase and for the same time period. At the end of this phase, the data should demonstrate that the system will consistently produce the desired quality of water. The third phase of validation is designed to demonstrate that when the water system is operated in accordance with the SOPs over a long period of time it will consistently produce water of the desired quality. 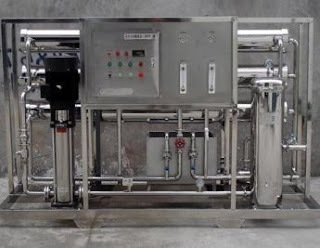 Any variations in the quality of the feedwater that could affect the operation and ultimately the water quality will be picked up during this phase of the validation. Sampling is performed according to routine procedures and frequencies. For Water for Injection systems, the samples should be taken daily from a minimum of one point of use, with all points of use tested weekly. The validation of the water system is completed when the firm has a full year worth of data. A typical problem that occurs is the failure of operating procedures to preclude contamination of the system with non-sterile air remaining in a pipe after drainage. In a system illustrated as in Figure 1, (below) a typical problem occurs when a washer or hose connection is flushed and then drained at the end of the operation. After draining, this valve (the second off of the system) is closed. If on the next day or start-up of the operation the primary valve off of the circulating system is opened, then the non-sterile air remaining in the pipe after drainage would contaminate the system. The solution is to provide for operational procedures that provide for opening the secondary valve before the primary valve to flush the pipe prior to use. Regarding microbiological results, for Water For Injection, it is expected that they be essentially sterile. Since sampling frequency is performed in non-sterile areas and is not truly aseptic, occasional low-level counts due to sampling errors may occur. Agency policy is that less than 10 CFU/100ml is an acceptable action limit. None of the limits for water is pass/fail limits. All limits are action limits. When action limits are exceeded the firm must investigate the cause of the problem, take action to correct the problem and assess the impact of the microbial contamination on products manufactured with the water and document the results of their investigation. With regard to sample size, 100 - 300 mL is preferred when sampling Water for Injection systems. Sample volumes less than 100 mL is unacceptable.